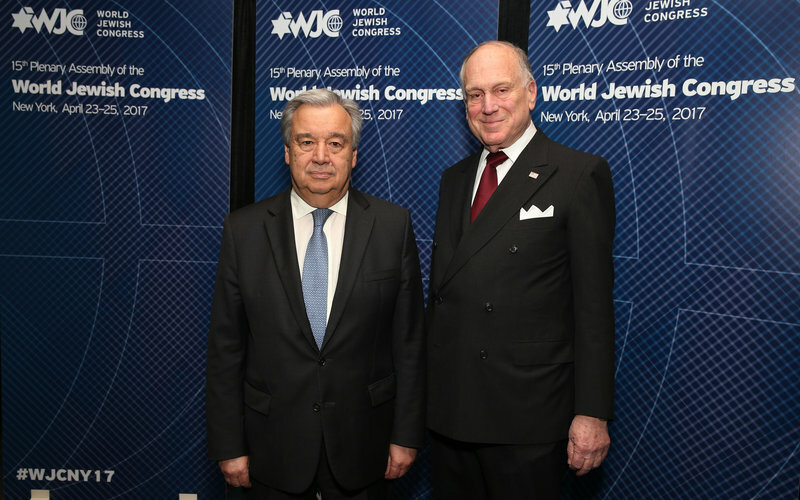 United Nations Secretary-General António Guterres addressed the opening dinner of the World Jewish Congress Plenary Assembly on Sunday, pledging to delegates: "As secretary general of the United Nations, I will be on the front lines in the fight against anti-Semitism." "The modern form of anti-Semitism is the denial of the existence of the State of Israel,” the secretary general added. He also recalled his strong emotions when he visited a nearly empty synagogue of the Portuguese Jewish community in Amsterdam, because it had been decimated in the Holocaust. Guterres said "anti-Semitism never died despite the shock of the Holocaust," and added that it was “alive and well today”, citing hate speech on the internet, physical aggression against Jews, and the destruction of Jewish monuments and cemeteries. This was the first time a UN secretary general has addressed an international gathering of Jewish leaders. Over the course of the three-day assembly, delegates will hear reports about the situation of Jewish communities world-wide and discuss major issues, including anti-Semitism and the rise of extremist political movements. A WJC-commissioned report will be presented that details the proliferation anti-Semitism on the internet, and policies to combat such phenomena will be discussed. The delegates will also elect the WJC leadership for the coming four-year term. Current WJC President Ronald S. Lauder is standing for re-election. Other speakers at the event include UNESCO Director-General Irina Bokova, Canadian Foreign Minister Chrystia Freeland, US Ambassador to the United Nations Nikki Haley, Israeli Minister of Intelligence and of Transportation Yisrael Katz, Israeli Ambassador to the UN Danny Danon, US Representatives Eliot Engel, Nita Lowey and Lee Zeldin, European Commission Coordinator on Combating Anti-Semitism Katharina von Schnurbein, as well as the Jewish Nobel Prize laureates Roald Hoffmann (Chemistry), Daniel Kahneman (Economics) and Eric Kandel (Medicine).